Anything that consists of bacon has to be a winner. That’s a fact. Ask my husband. I promised to make these quite some time ago for Wesley, and I finally got around to it, just a couple years later. These are so amazing, I definitely wish I would have made them sooner. 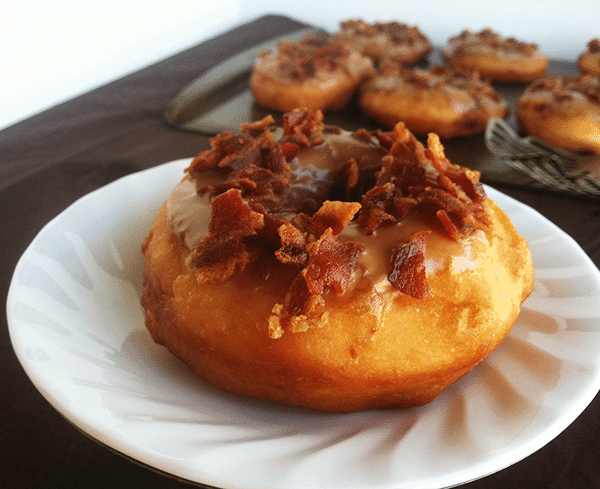 The donut has the perfect crunch with the sweet glaze and the salty bacon, it’s mind blowing. Wesley offered to share them at work, and yet they never made it. There’s no mystery here. We packed them away ourselves. Thank goodness it’s warming up outside. I can just feel the pounds gathering. Hopefully taking my almost two-year-old outside to play and chasing him around for a few hours will shed the poundage. I won’t count on that though, I usually make up for it in cookies and cake. a lot of cake. If there ever was a recipe for you to try, it is this one. Yeah, that was me. I planned on only taking one bite. It got out of hand. My bad. Place your small bowl of milk in the microwave for about 1 minute. This will depend on the power of your microwave. You'll need your milk about 110-115 degrees anything hotter can kill your yeast and it won't activate. Pour the milk, yeast, and sugar in your stand mixing bowl. Let it stand for about 10 minutes or until it is foamy. Pour in the flour, yolks, and butter. With the dough hook, mix until it forms a ball. Place the bowl in a warm place and cover with a hand towel until doubled in size. I like to turn my oven on about 200 degrees and place my bowl on the stove top with an oven mitt underneath the bowl. It took my dough about 1 and half hours to rise. Lay a large piece of parchment paper on your counter and dust with flour. Place the dough on the floured surface and roll out until the dough is about 1/2" thick. Spray nonstick cooking spray on a sheet pan. Using your donut cutter, cut out as many donuts as you can. Place all the donuts on the sheet pan. Spread them about 1- 2" apart on the pan. 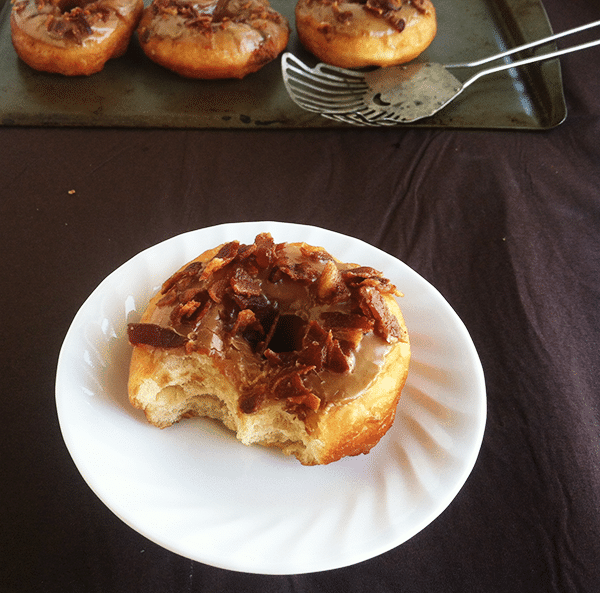 Spray the tops of the donuts with nonstick cooking spray and cover them with plastic wrap. Let the donuts sit for about 30 minutes or until doubled in size. In a dutch oven, pour your vegetable oil in. I only had about 2-3" of oil. Bring it up to 350 degrees. Place the donuts in batches into the oil. If you add too many donuts at once, it will drop the temperature of the oil too much and your donuts will be a greasy mess. Once the bottom of the donut gets a golden brown color, use a spider or metal spatula and roll the donut to the other side. When the other side has turned a golden brown, place them on a sheet pan layered with paper towels. This will absorb the oil. Repeat the frying until all the donuts are golden brown and deep friend. Dip them in the glaze and sprinkle the topping on them. That's it! In a medium bowl, add in 1 cup of powdered sugar, maple extract, and 2 T. milk. Add the rest of the powdered sugar and whisk. If the glaze is too thick, add another tablespoon of milk. On a cooling rack, place all your bacon side-by-side. Put the cooling rack inside a sheet pan so it will collect all the bacon grease. Let the bacon cook until it's done to your liking. Mine cooked for about 35-40 minutes. Let the bacon cool and crumble into a bowl. The yeast donuts were adapted from Paula Deen. 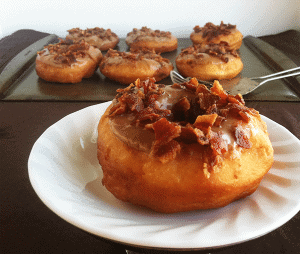 I hope you enjoy the Maple Glazed Yeast Donuts sprinkled with Bacon! 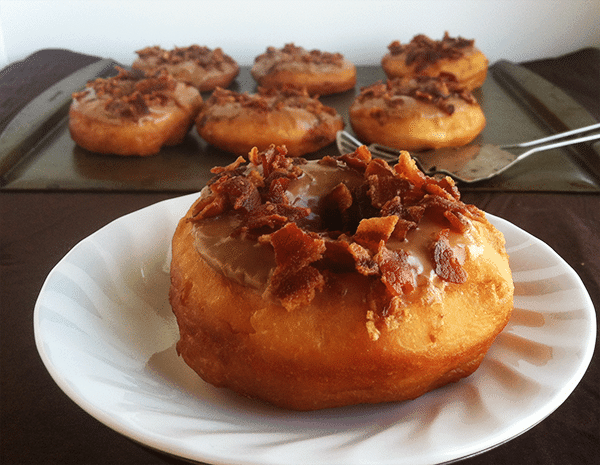 Maple bacon donuts are the bomb! I so want one of these right now! They are the bomb. They were gone so quickly. I could probably sit down and eat an entire batch!